2. both have delightfully green middles. And that is where the similarities end, friends. Because this is a post about maybe the most refreshing thing you will make and subsequently inhale all summer long. Imagine this: it’s hot. Sweltering, even. You’ve just had a lovely dinner and you want something to top it off, but not anything heavy, or laden with sauces and toppings. Fresh and bright, but more substantial than the fruit you picked on earlier. You want it to be portable, because who wants to make up (or clean, if you’re the host) one more dish, and besides: people are waiting on you to finish the game of croquet you conned everyone into playing earlier. And you don’t want to wait: you want it now. *sigh* You are sooooo hard to please, and you know it. No one will be able to satisfy your cravings, and you should have known better than to get your hopes up. What is that? Why is it so adorable and also, why is it calling to me with a force beyond anything I’ve ever felt before? Because it’s a petite, completely portable, bracingly fresh, chocolate-coated ice cream sandwich. And it wants to be your summer after dinner-mint. 1. Mint ice cream – It’s a Jeni’s Ice Creams recipe, which means no fooling around with egg yolks. It’s got fresh mint leaves and a wee bit of cream cheese to keep things scoopable. And like all Jeni’s ice creams, it’s exceptional. but so long as you can be careful with them, you should be fine. More on that later. 3. The dipping chocolate – It’s a little something I’m obsessed with at the moment which requires no tempering whatsoever. It melts and coats even frozen things like a dream with seriously no mess and no melting; you can actually watch it harden right before your eyes. It’s amazing. All of this makes for an easy, perfect summer dessert (or anytime dessert, or anytime snack, who are you kidding, you know you’re grabbing one of these things out of the freezer “accidentally” at 11 am) that’s totally unstressful to make. Make up the ice cream days ahead, if you’d like, then melt the chocolate, assemble the sandwiches the day of or evening before, and you’re all set. They really are that easy. Certainly if you don’t have access to an ice cream maker, you may substitute storebought ice cream, but do yourself a favor and go with a good-quality one: I’d recommend Talenti Mediterranean Mint because the flavor is very similar and made with fresh mint leaves like this one. So let’s talk about the chocolate I used here. A while back, someone at Chocoley (a gourmet chocolate company out of Georgia) contacted me and asked me if I’d be interested in their products. You know me: I screen these offers pretty carefully because I won’t bite if there are strings attached. Oddly enough, they really wanted to just send me some product and I was under zero obligation to use the product, but if I did, they wouldn’t mind a little mention in the post. Now how cool is that? Companies, take note: you should be so confident in your product that you’re willing to send it out with nothing required in return on the notion that the recipient will be so happy with it they talk about you anyway. Chocoley, you win at confidence. As well they should: First off, they asked me what I wanted to try versus sending me their own selections. Secondly, they called themselves “Oompas” – as in that was their job title – which automatically earns you extra fun points in my book. Thirdly, their product is of stellar quality and tastes like high-quality candy, versus those candy melts you can buy at craft stores that taste like waxy, “chocolate flavored” weirdness. So they have every reason to be confident that people will love their product. The no-tempering thing, which is their “Bada Bing Bada Boom” line of dipping and coating chocolates (again, extra fun points for name) is pretty rock star. I barely had to pay attention to what i was doing, which means i could focus on putting the sandwiches together versus standing over hot chocolate. Since this chocolate is designed specifically for dipping things into, it’s thick, solidifies fast, and stays creamy even at a lukewarm temperature, making it ideal for any ice cream sandwich, really. I used the Bada Bing Bada Boom dark chocolate and extra dark dipping and coating formula chocolate for this, and I’d recommend either strength for this; use what you like best. You can order it from their website, and I know it got to me really fast. Because it’s summertime, I’ll warn you: this chocolate wants to melt. That being said, make sure if you have a package coming that you don’t leave it sitting outside, and the same goes with inside: don’t leave your chocolate sitting in direct sunlight or in a warm spot or it will do exactly what it’s designed to do. Make sure your ice cream is completely frozen – don’t think an hour in the freezer post-spin will cut it, because you want this as solid as possible. Freeze it in small, pint-sized containers and throw them back in the freezer if it starts to get too soft. Inspect the wafers at the store – Listen, these Nabisco wafers are fabulous, but they have a fault line right down the middle of them which makes them really prone to snapping in half. Inspect your chosen box at the store and then snuggle it like a newborn baby from checkout to sandwich assembly. Better yet, buy an extra box. Always work from the middle – when assembling these, support the bottom wafer in your hand while you gently lay the ice cream down in the center. Set the second wafer on top and then press both sides in from the very center; the more centered the pressure is, the more evenly the ice cream scoots towards the edge. Fine tune any gaps by applying pressure in their general direction. Maneuverability is key – What if Superman couldn’t find a phone booth when someone was in trouble? Chaos would ensue. I freeze a lipped sheet pan in my freezer, place a sheet of parchment on it, and pull it out and use it as my work surface. not only does it extend the assembly time a little, it also means accelerated my chocolate solidifies faster, my ice cream doesn’t drip, and I can move the entire thing to the freezer in one fell swoop should I need to. Keep stirring – Keep a spatula in your chocolate while you dip: it helps to scoot the pool of chocolate where it needs to go, and it keeps it smooth. You’re putting something frozen in something warm, which means the temperature on the warm thing is going to reduce each time you dip a sandwich. Eventually, your chocolate will begin to re-harden. Stop what you’re doing, place your frozen things in the freezer, and heat up that bottom pan of water again. I had to reheat the chocolate a few times during this process, and had no problems doing so. I enjoy when I set out to write a brief post and it turns into a diatribe complete with outlines and a full tutorial. Someday I will publish something less than 1,500 words long. Thank you again to the very charming oompas at Chocoley for sending me all their chocolate. I still have some left, which means you’ll see more of it as the summer progresses. If I don’t use it all up in repeat batches of these ice cream sandwiches, that is. Thank you also, Chocoley, for waiting basically forever for me to post something: I wanted to do something really great for you, because you have an incredible product which I will be using again, and I hope you love it what I did here. Ice cream adapted only slightly from a recipe for Backyard Mint ice cream (and I did, in fact, use mint from my backyard) from Jeni’s Splendid Ice Creams At Home by Jeni Britton-Bauer. Jeni is my hero, especially in the summer, but truly all the time. Her ice cream concoctions are magical. *I have used other cream cheese varieties, and truly, Philadelphia brand seems to be the only one which doesn’t have a pronounced “is that cream cheese?” flavor in the finished ice cream. I wish this weren’t so, because certainly the Philly brand is the most costly, but it IS true, so use it. **If you’re making the ice cream just to eat, doing without the extra boost of peppermint via the extract is perfectly fine. I wanted to bump up the flavor a little since I knew this ice cream was going up against both a chocolate cookie and a solid chocolate coating, and the extra extract gives it a more candy-like flavor, in my opinion. You can also use it if you feel like your mint isn’t as flavor-packed as you’d like it to be, but go slowly and start with a 1/4 teaspoon. ***And if you don’t feel like living on the edge like I do with an impossible-to-predict broken cookie variable, use a more sturdy cookie, but your finished product will be different than mine due to taste and thickness. 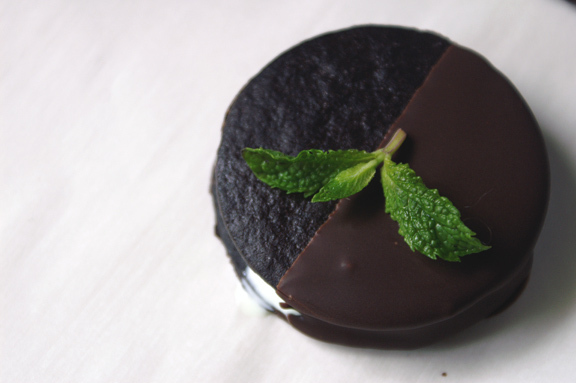 I’d try this with an Oreo (scraped clean of filling, of course) or other darker, plain chocolate cookie of your choosing. Remember to throw your ice cream maker in the freezer for the required amount of time prior to starting this recipe: sometimes I forget, so I wanted to remind you. As i mentioned above, you extend your assembly time if you work on a cold surface, so throw a half sheet pan lined with parchment in your freezer as well, and remove it just before you begin to assemble the sandwiches. As far as tools, you’ll need a melon-baller or very small (like the smallest one) ice cream scoop and a regular teaspoon to scoop the ice cream balls. In a small bowl, whisk together the cornstarch and 2 tablespoons of the milk. Set aside. In a large bowl (which will fit inside a larger bowl when you do your ice bath later on), whisk together the cream cheese and salt until smooth and blended. Set aside. In a large, heavy-bottomed saucepan, whisk together the remaining milk, heavy cream, sugar, and corn syrup over medium-high heat. Bring to a rolling boil, stirring frequently, and once the mixture begins to boil, stir constantly for 4 minutes. Remove from heat. Whisk together your cornstarch mixture once more (it tends to separate out if it sits too long) and add it to the cream mixture, stirring constantly. Place back over medium-high heat and cook, stirring constantly, until slightly thickened, 1-2 minutes. Remove from heat. Pour heated cream mixture slowly into cream cheese mixture, whisking constantly, until smooth and homogenous. Fill a larger bowl with cold water and ice, and float the bowl with your ice cream base inside it, stirring occasionally, until cooled. Remove from ice bath and place in the refrigerator for at least 4 hours or overnight to steep. 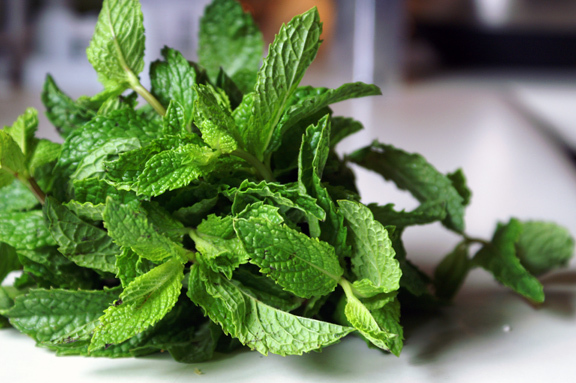 Remove from the refrigerator and strain out the mint leaves using a fine mesh strainer. Pour the ice cream base into your ice cream machine and spin according to manufacturer’s instructions. 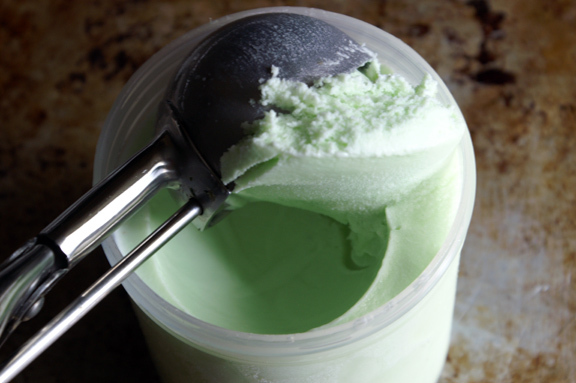 Pour frozen ice cream into canisters and freeze until firm, at least 4 hours, until solid. Before you do anything, open your boxes of cookies carefully and remove them to see which are still intact, and lay them out gently so they’re easier to grab. Have your melon-baller/very small ice cream scoop and teaspoon at the ready, then set out your frozen ice cream and frozen sheet pan lined with parchment paper. Using the melon baller, scoop a heaping ball of ice cream out, rounding it out with the teaspoon. With a cookie face-up in one hand (support the center), gently set the ice cream ball in the middle. Top with another cookie and carefully press down from the center to spread the ice cream out to the edges evenly. Set on the prepared frozen sheet pan and repeat; I usually can get about 8-10 sandwiches assembled before I need to throw everything back in the freezer for a few minutes. Have a container ready to store your finished sandwiches, and repeat the process until you’ve completed all of your sandwiches. Let firm up in the freezer for at least an hour. So the Chocoley people send along really great and really specific instructions (which you should follow) on how to melt their chocolate, and it’s exactly how I did it, and it worked beautifully. If you’re not using their chocolate, I suggest heating your chocolate in a double boiler over just simmering water, stirring frequently until it has melted. Set aside and allow to cool slightly: no one wants to put molten chocolate and frozen ice cream together unless they’re asking for trouble. My favorite thing about the Chocoley product is that it stays creamy and melted even when it’s basically at room temperature, which makes for easier sandwich assembly. Once your chocolate has cooled down but is still creamy, set up your workstation and remove your frozen pan once again from the freezer, along with the sandwiches. Working quickly, dip each sandwich halfway into the chocolate; I used a back-and-forth motion to really get the chocolate on the cookies and to make an even line. Bonus: the chocolate helps to stabilize any cracks or weak spots which happened along the way, so look at each sandwich before dipping to see if there’s any cracks to cover up. Set onto the parchment-lined frozen sheet pan and repeat until the chocolate begins to firm up again or the sandwiches need to be transferred to the freezer; like the sandwich assembly, you should be able to get through about 8-10 sandwiches, maybe more, before you need to reheat the chocolate and scoot the sandwiches back to the freezer. 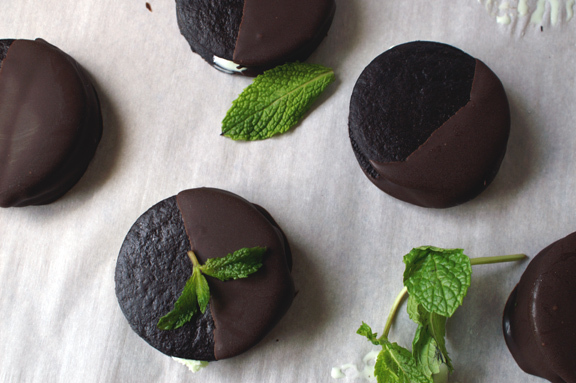 Repeat the process until all your ice cream sandwiches are chocolate covered. These are best served either the day of (the chocolate coating firms up fast, so they’re ready maybe 20 minutes after you finish coating them, and that’s only to re-freeze the ice cream), and they store well up to 2 days in the freezer. 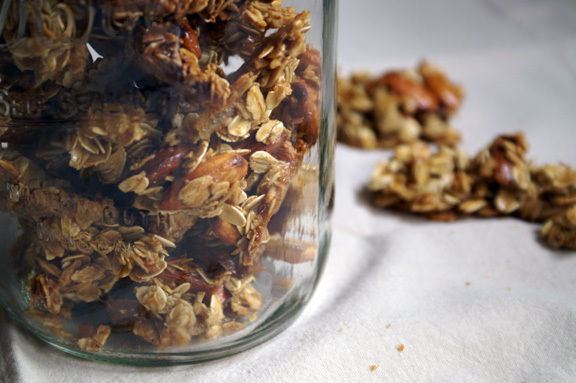 Be sure to store them in an airtight container with wax or parchment paper in between the layers. 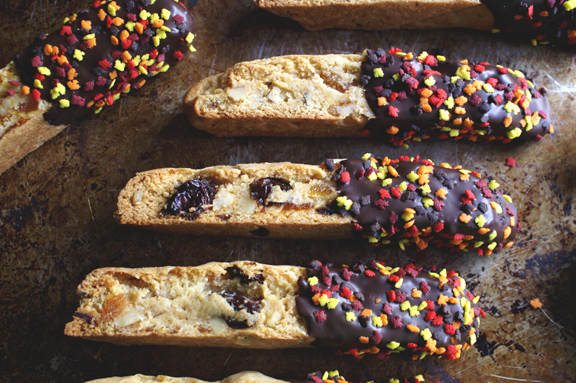 chocolate-covered cherry, apricot, + walnut biscotti. 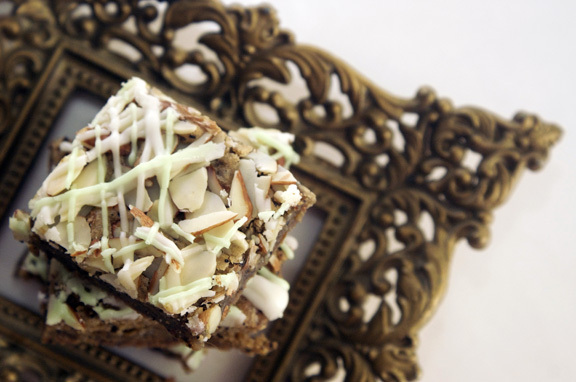 st. patrick’s irish coffee blondies. Well Allison, thank you for saying it: i really did think this post would be relatively short and then i realized that the opposite was going to be true. At least some of you like it and forgive my lengthy posts! 🙂 I’ll always aim for the 1,500 word minimum, i promise. unless, diagrams, which i try to always find some excuse for. I dunno, 1500 words is just getting warmed up. 😉 That’s your style — don’t mess with it. Unless, of course, you really don’t have a whole lot to say about something, and sometimes that happens. Anyway, these look great. I didn’t knew Nabisco had “famous” wafers! I gotta get out more. And I totally agree about Philly brand cream cheese (it was the first national brand for a reason). And tempering chocolate? Why would anyone want to do that? Yes, it helps shelf life and you don’t have to refrigerate things dipped in tempered chocolate. But it’s not like 1) these aren’t going to be eaten soon, if not immediately (shelf life? Ha! ); 2) you’re going to store these at room temperature. 😉 Really fun post & recipe. Thanks. That’s a big compliment coming from someone who definitely manages to keep his posts both abbreviated AND thorough – no small feat, and one i admire. And i do love the occasional very short post, and have done a precious few of them: i suspect you may see more of that over the summer as i’ll be knee deep in, well…summer. They do have a “Famous” wafer, and i daresay they most famous thing about them is that miraculously, people still buy them even though most of them end up broken, but they ARE worth the effort, and are great for ice cream sandwiches and icebox cakes: there really is no comparable product out there. And Philly is just the best, period; for everyday use items (i.e. bagels) i’m game for whatever, but in baking, it’s always the Philly. Another evil-genius creation. You have one-upped peppermint patties, the one candy that makes me think twice about buying a snickers. I like it when you call me an evil genius, Matt. Really? Now i would say that although it would be at times a tough call, the Snickers would win every time for me. In fact, you may have just happened upon a future project for me that’s very similar to this one. Evil is the new angelic when it comes to desert…at least that’s what I would tell myself while stuffing my face with these things! PP’s make me think twice, I love peppermint…..but I always grab a snickers first. Though I will say that Milky Ways and Three Musketeers are useless. We are on the same wavelength this week. The kid and I are making ice cream sandwiches tomorrow for a party we are having next week. For all those reasons you listed. And what better dessert to have at a June BBQ? 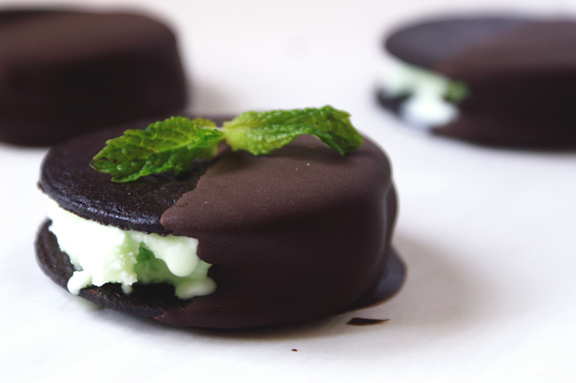 Later in the summer, when we aren’t planning for a big party (for the kid’s confirmation, complete with out of town guests) we will make these bites of minty goodness. And I am definitely going to have to check out the Chocoley products. They sound perfect! And the tip on freezing a baking pan to work on – brilliant! I am going for quantity with my sandwiches, so I’ll be baking the wafers in sheet pans and spreading big squares with softened ice cream. Then after re-freezing I’ll cut each big square into smaller squares. But the frozen sheet pan will streamline matters beautifully, I think. No dripping ice cream edges before I can get the top on and no dripping edges while I am carving up the ice cream sandwich slabs. Brilliant, I say! Ice cream sandwiches really are the thing to do for summer parties: kid and adult, because when was the last time you heard someone turn down an ice cream sandwich? NEVER, that’s when. For sure, look Chocoley up if you’re doing any sort of candy or dipped things: SOOO easy to work with, and let’s be honest, sometimes chocolate products like this lack in the flavor department, but their products were truly delicious; not at all like the normal “chocolate melts” that sometimes are so-so. I’d love to say i went into this knowing i’d be freezing a pan, but it took some problem-solving on my end, only because jeni’s ice cream has that scoopability from the cream cheese that’s wonderful, but it does mean that it’s prone to getting soft FAST: the frozen pan solved the problem of melting and of me having to open the freezer every 4 seconds to throw another sandwich in there. I love your ice cream cookie slab idea! let me know how that works, logistically: i’d love to compare notes in terms of timing, etc. I’ll try to document the whole assembly with pictures. And I’ll keep timing notes. It might even be a blog post sometime next week, though no promises. Not rocking the posting lately, unlike you. But I’m owning the slowdown and going with it. The tricky thing will be chilling the ice cream the right amount before making the sandwiches. That is why I want to start this week for the party that is in 10 days. I might end up with a freezer full of less-than-perfect ice cream sandwiches. Not a bad problem to have! Forgot to say it, but your posts are the perfect length. Own that. (I just said, “own that,” twice in one comment. I guess that is my phrase of the day.) It is your style. Of course, if you feel like a short post one day, do that. It’s your blog, and it’s wonderful! Please, please, please keep diatribing away! Your descriptions and your tips are what I thrive on! I love it and I love this incredible better than an Andes mint (gasp!) dessert!!!! Those famous wafers are deadly delicious, as is anything Jeni’s (yay! Jeni! Ohio!) and dark chocolate. Plus I love how you’re living on the edge is you dare to use these wafers. It’s so true. I suspect I’d have a huge pile of broken wafers that would get tossed into a bowl with a scoop (or three) of ice cream and the remaining chocolate. Nom. By the way, did you see Jeni’s new cookbook out? I haven’t actually flipped through it, but hope to soon. I also hope to make enough room in my freezer even sooner so I can put my ice cream maker bowl in there and go to town making frozen desserts this summer! DIATRIBE I SHALL! Hey, if it helps people and you all like it, then i see no reason to change, right? It’s nice to hear, because i’d have a hard time changing it up, as it’s my natural tendency in writing to ramble on and on. Yay for Jeni’s anything, right? LOVE, love all the ice creams – without exception – from her first book, and i can’t wait to get the second one (which is in my Amazon cart right now). i’ve yet to flip through it, but some cookbooks i’ll buy sight unseen; that’s one of them. I trust it. AND THE GRAVELS ARE IN THERE I THINK!!! sorry…got super excited there, but those gravels i can see in all sorts of applications beyond the ice creams, very much like the momofuku crumbs (which are essentially the same thing). the gravels are exactly like the momofuku crumbs! I got that cookbook for Christmas, by the way, and may have scarfed the sprinkle milk crumbs straight from the pan before and after making the confetti cookies. The only reason I haven’t made more is because I will eat them ALL! But I love what you’re thinking – gravel applications! If the sesame one is there…..oh boy! Ooh, these look so delicious AND so pretty! I’ve made Jeni’s mint ice cream before, and it was fantastic! It is a fairly subtle mint flavor, though, so I can definitely see how adding mint extract to it when serving it with lots of chocolate would be a good idea. I’m going to have to give these a try, although because I’m me, I’ll probably make some homemade chocolate wafer cookies for them. I’m making a new (to me) Jeni’s flavor today. I’ll let you know how it goes. I love it when we both make something, because then we get to compare notes. 🙂 I agree: the finished product from the book without the extract is lovely but very subtle, even with an overnight steep, which i love, but when there’s double chocolate involved, it’s nice to go a little bigger in the flavor department. You make those homemade wafer cookies, Faygie! i know you can. I wanted to, and i will at some point, but i thought this may be a decent way to go for people who just want an ice cream sandwich without the hassle. I have a hard time making my wafers thin, so i need to work on that this summer. i can’t WAIT to hear about your jeni’s recipe: i’ve had a 100% success rate with that book, and i’m convinced there’s not a single recipe in there that isn’t wonderful. Can’t wait to get the second book. I’ll be honest–one of the few things I really can’t justify in the kitchen is buying an ice cream machine, because my husband doesn’t really like ice cream due to lactose-intolerance (certain things are better than others, but ice cream is a huge oh-no-no) and so I haven’t really eaten any in *years. * But these sandwiches look amazing, and despite the very good possibility of me feeling ill after eating one, I’d still like one right now, please. 1 – I don’t have to imagine that it’s sweltering – it’s 108 out today and we’ve upped our ice cream consumption to 1 pint a week. 2 – I LOVE THE BADA BING DARK CHOCOLATE. Seriously. That stuff is AMAZING. 3 – I will never forget the day i first learned about the nabisco wafers – ALL THE DELICIOUSNESS OF AN OREO COOKIE W/O HAVING TO DEAL W/ ANY OF THAT FILLING STUFF? YES PLEASE! Which means removing that filling and replacing it with my favorite ice cream (HI JENIS!) and then dipping it into some amazing dark chocolate…. I might just faint. 1. GROSS. seriously, AZ needs to get it’s act together with the heat. it’s too early! 2. it has the best flavor! and the extra dark is pretty awesome, too, yes? totally yes. 3. I had zero idea they existed until i think Amy posted something with them, and then there was the period where i looked for them and couldn’t find them, then i did….the rest? history. because NO FILLING TO SCRAPE! 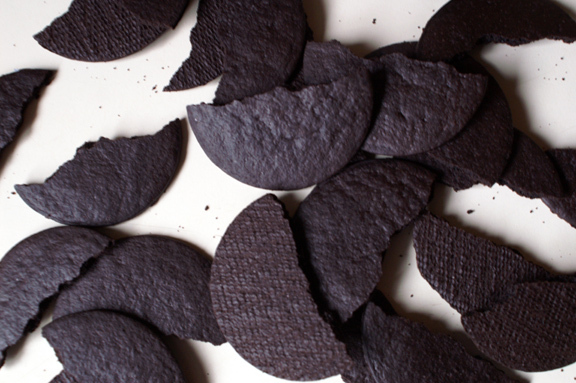 and they’re bigger than Oreo’s, and flatter, but we just really need them to work on that breakage issue. i think you should get to work scraping oreos that i know you have in your pantry, tho. AND i know you have some Chocoley, so…. Every time I had a dance or piano recital, my dad would take me to Baskin Robbins. I always got a scoop in a cup of Mint Chocolate Chip. These? They were basically made fuh meeeee! Well now! 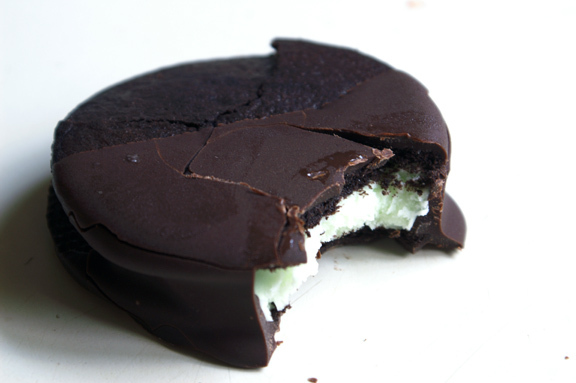 I suggest a Turkey Burger and Double Dark Chocolate-Dipped Mint Ice Cream Sandwiches for dessert! With that menu my weekend would be fabulous! A scrumptious recipe to bid spring goodbye and welcome the summer heat! Now THAT would be a nice combo for a summer night, for sure! Thanks, Deb! Shannon, I love these cute little ice cream sandwiches and that chocolate sounds killer! I am now wishing I had Girl Scout thin mints in the freezer because these might make the perfect outside cookie and then i could double dip them. Maybe that wouldn’t work? Whatever. I am going to try this as I still have mint in the garden and it is starting to get hot. I love the length of your posts. Much better than the length of my comments! Mmm, I know one bearded fellow who would be pretty darn happy if I decided to make these this weekend 🙂 They look so refreshing, not to mention purty. I do think it’s time I pulled out my ice cream maker for the season and that mint ice cream recipe sounds awesome! Also, I need the Jeni’s ice cream cookbook! i’ve been thinking it over, and this might be the year i get an ice cream machine. becuzzzz, i have a copy of jeni’s book, and there is not much i can make from it without a machine and that makes me soooo sad because the pictures are all so pretty and the ingredients are all so nommy and i just want to eat some of that stuff already! I happen to adore Andes mints, and I also happen to love long blog posts. These look amazing; so amazing, in fact, that I’d love to hoard a few dozen in my freezer. Pinned. This pretty much sums up what my son and I love in a summer dessert/ice cream sandwich. Looks utterly delicious and that chocolate dip takes it over the top. I’ve heard good things about this chocolate dip and I’m glad to know you endorse it too. I can’t temper (and don’t want to) for my life. It’s a great option.